Few jobs are more stressful than those in the airline industry. If you’re an air traffic controller, the laser-like focus needed to keep track of inbound and outbound aircraft is intense. On the ground, the pressure on mechanics who work on critical systems is enormous. For dispatchers and ground security coordinators and everyone else involved in keeping a $1.5 trillion industry going around the clock, the slightest lapse in attention can literally make the difference between life and death. Even mistakes that don’t cause injury, however, can disrupt an industry that provides 10 million jobs and transports 2.3 million people every single day. The fear of making those mistakes often drives the men and women in those jobs to seek relief … and often, that relief comes in the form of a chemical. Alcohol and drugs aren’t any more rampant in the aviation profession than in any other, but the safety-sensitive nature of airline transportation makes the consequences of their use more dire. A Columbia University Mailman School of Health study of 5,000 drug tests taken after accidents between 1995 and 2005 revealed that drug tests of airline personnel are three times more likely to come back positive after a crash or other accident than when testing is done at random times. And when drug and alcohol use become a problem … when they cross the line from stress relief to coping mechanism … that’s where Cornerstone of Recovery’s Aviation Program comes in. For more than a decade, we’ve established a specialized treatment path that addresses the high-stress, high-pressure world of employment in the airline industry, and we’ve developed a reputation as one of the leading treatment centers in the nation with the airlines and various unions. The goal of substance abuse treatment at Cornerstone is to address the issues that lead to addiction in the first place – the emotional turmoil that patients deal with on a daily basis, the ones for which they can find no relief except in the ingestion of a chemical. The first step is Medical Detox, which will slowly and safely wean the patient off of drugs and alcohol; it’s a medically supervised process that includes around-the-clock care, after which the patient is integrated into a larger treatment community with peers from all walks of life. In addition to standard therapeutic tools that include Activity Therapy, Group Therapy and more, patients will be given the opportunity for psychiatric evaluation and, as part of the Aviation Program treatment path, meet several times a week with others in the industry. At Cornerstone, we’ll teach you how to manage stress and cope with the rigorous demands of your careers. We’ll help you find a way to keep a job that you enjoy while living a life you love, free of the demand for another drink or another pill just to keep from drowning in the responsibility placed on you by your employers and yourself. We know that on the job, your priority is the safety of others, but if you’re not safeguarding your own physical, mental and emotional stability when you’re off the clock, then your ability to perform is compromised. It doesn’t have to be. Thanks to our Aviation Program, employees at every job in the aviation industry can find relief from the diseases of addiction and alcoholism. 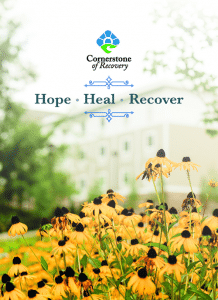 Call Cornerstone of Recovery today for more information, and see if we can help you find a new way to live.